AWAKE, EARTHLINGS! It’s later than you think. 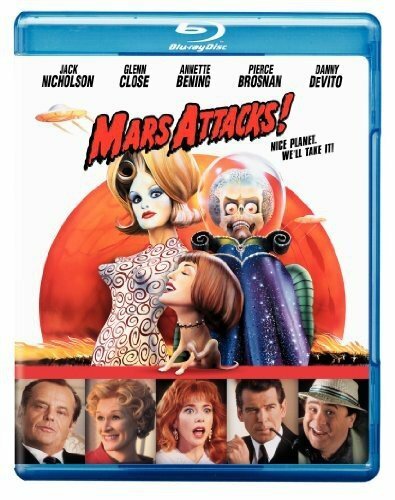 Don’t miss the hilarious frenzy as Tim Burton directs – and Mars Attacks! SEE! Stars that shine across the galaxy. 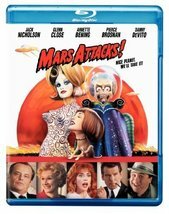 Jack Nicholson (in a dual role), Glenn close, Annette Bening, Pierce Brosnan, Danny DeVito and a dozen more! SHRIEK! At mean, green ivaders armed with insta-fry ray guns, endowed with slimy, humongous brains – and enlivened with state-of-the-art special effects. GASP! As the U.S. legislature is overwhelmed. (Don’t fear, we still have 2 out of 3 branches of the government working for us.) THRILL! As Earth fights back with an unexpected weapon. Take that, Martians!